There are two types of electric circuits, the series and parallel circuit. A series circuit there is only one path for the electrons to flow (see image of series circuit). The main disadvantage of a series circuit is that if there is a break in the circuit the entire circuit is open and no current will flow. An example of a series would the the lights on many inexpensive Christmas trees. If one light goes out all of them will. In a parallel circuit the different parts of the electric circuit are on several different branches. There are several different paths that electrons can flow. 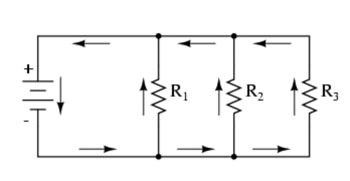 If there is a break in one branch of the circuit electrons can still flow in other branches (see image of parallel circuit). Your home is wired in a parallel circuit so if one light bulb goes out the other will stay on. In your home you will notice that most outlets have 3 prongs. Connected to the outlet are three wires. Two of the wires run parallel to each other and have a potential difference of 120 volts in the US, in Europe the potential difference is 220 volts. The third wire is connected to the ground. A wire that is connected to the ground provides the shortest path of electrons to Earth.This third wire carries no current. The wire is simply a safety feature against short circuits. A short circuit is when an accident occurs that lets electricity take a shorter path within the circuit. 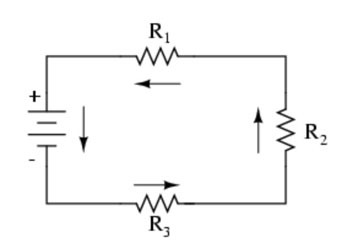 These circuits have less resistance and therefore more current flow. If the high potential wire should touch the other metal surface of an appliance the entire appliance will draw current and give the person touching it a shock. The ground wire having a shorter circuit provides a safety feature, so instead of current flowing through the appliance it will flow to the ground. Your home only allows so much electricity usage at a time. Depending on the wiring some homes may allow as much as 150 amps to enter the whole home at one time, This is divided among many circuits. The average circuit in a home is 15 or 20 amps. More current flowing through the wire will cause them to heat and could start a fire. It is therefore necessary to have devices that will stop the flow of electron when the current gets to high. A fuse is a common device in many homes. Inside the fuse is a tiny strip of metal. When the current flowing through it is too high it will cause the thin strip to melt and this will cause the circuit to break. a) as current in the wire increases beyond a certain point a chemical change occurs which converts the conducting material to an insulating material. This cuts off the flow of current. c) a fuse works when the metal inside expands from the heat and break the container causing a short. d) a fuse contains a vacuum which allows current to flow. When too much current flows through the fuse the vacuum is lost and the circuit is broken. 3. What is the main disadvantage of a series circuit. b) the main disadvantage of a series circuit is that if there is a break in the circuit the entire circuit is open and no current will flow. 4. In your home the socket contains 3 holes. Which statement is not correct about these holes. a) Two of the wires run parallel to each other and contain 120 volts in the US. a) When appliances in your home are connected in a parallel, each of them can be put on and off independently. b) It ensures all components in the circuit have the same voltage as the source.